David Price, Thirty Years Without Getting Bored! Michael Cotton had the opportunity recently for a long and wide-ranging chat with David Price. He tells Michael about the highs and lows of a career that shows no sign of drawing to a close just yet. The wheel has turned full circle for David Price, one of motor racing’s most experienced team managers. Having spent five years managing cars for Don Panoz, including running no fewer than five at Le Mans in 2000, he has just accepted an invitation to step back in time with the Irish-American and was last seen running the DeltaWing Panoz in the Sebring 12-hours. It was a short outing, as the car was far from ready. It turned out that the main reason Panoz wanted to run the DeltaWing at Sebring was to show off the new coupe, which will race later in the season. Meanwhile, the open car is undergoing a test programme, with Katherine Legge and former Panoz driver Johnny O’Connell, and is scheduled to compete at Mazda Raceway Laguna Seca on May 11th in the hands of Ms Legge and Andy Meyrick. It’s an adventurous project with an all-new engine, designed and built by Panoz Group’s Elan Motorsports Technology, replacing the Nissan engine which was withdrawn at the end of last season. “A month before Sebring the engine hadn’t been finished, the installation hadn’t been done and Michelin had pulled out. I didn’t have any equipment and I didn’t have a crew, which isn’t really the way you want to prepare for the first race of the season” says Price. Bridgestone stepped in (“they were amazing, they produced tyres in a month”), he took crew from Krohn Racing which was moving to a new location, rented equipment, and the new team was formed from the ground up. “I was bored” Price reflects, a condition that has marked a few changes of direction in his career, but he seems to be bored no longer. With former Willment employee, John Bracey, he formed the Bracey Price Racing partnership in 1975 to prepare and run race cars and subsequently formed David Price Racing to compete in the British Formula 3 Championship. In 1978 they would run the Unipart F3 team, separate from the touring car and rally programmes, with Ian Taylor and Tiff Needell, held back by the uncompetitive Triumph Dolomite engines. In 1979 with Nigel Mansell and Brett Riley, they won the first event of the year at Silverstone, but Nigel ended the season with a huge cartwheeling accident with Andrea de Cesaris, fracturing some vertebrae. Other graduates were Martin Brundle who, in 1982 won two race, took six poles and ended up third in the championship, and Johnny Dumfries, who dominated the British F3 Championship in 1984. 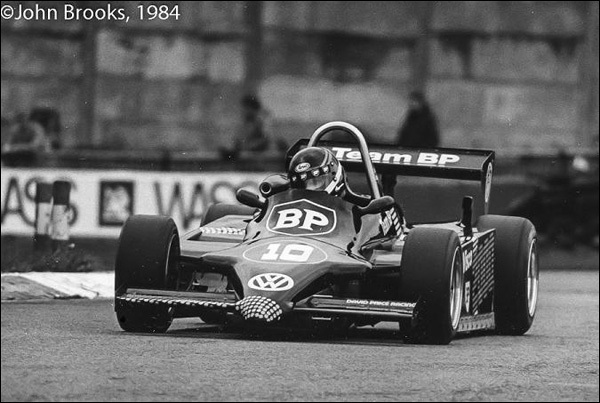 DPR also branched out into the French F3 Championship, winning the title with Pierre Petit (1982). Moving away from single-seaters, Price accepted an invitation to manage Richard Lloyd’s GTi Engineering Porsche team in 1987-88, the highlight of this venture being Jonathan Palmer and Mauro Baldi’s victory in the two-part Norisring World Championship race. It was not a full-time job as Price was busy developing his composites business. Price was at the forefront of making carbon-fibre components and even monocoques for the Sauber Mercedes C11 and 291. After Silverstone in 1988, Sauber team manager Max Welti invited Price to run the team, which succeeded in winning the FIA World Sports-Prototype Championship in 1989, making Jean-Louis Schlesser the driver champion, and more important perhaps, scooped first, second and fifth positions overall at Le Mans. “When Max approached me at Silverstone it did Richard a favour as he was short of money. Max worried about the organisation while I ran the pitlane for them, as the team was expanding rapidly. I ran the Schlesser-Baldi car in 1988 while Leo (Ress) ran the other car for Jochen Mass, then in 1989 the Baldi-Acheson Sauber Mercedes.” The two Swiss cars were in contention for the World Championship right to the final round in Mexico City. The Sauber Mercedes team was withdrawn from Le Mans after qualifying in 1988 following an explosive tyre failure (“they had so much downforce!”) but made amends with a sweeping victory in 1989 with Jochen Mass, Manuel Reuter and Stanley Dickens taking the honours ahead of Acheson, Baldi and Gianfranco Brancatelli (who was, as we heard from Acheson recently, just too slow). “Those Saubers were lovely cars, proper cars. They had loads of power from their V8 twin-turbo engines and were easy on the fuel. It was a great team to work with. When Jochen Neerpasch came, he changed the setup for 1990” [he started the ‘young driver’ scheme with Schumacher, Frentzen and Wendlinger]. Price was then invited to manage Nissan’s World Championship team in 1990, taking Acheson and engineer Bob Bell with him, but it was not a happy time for any of them. “Too many people had vested interests” is all Price wants to say about that. He was then invited to manage the Brabham Formula One team in 1991, working with the Brundle-Blundell duo. After that he took a three-year sabbatical to further the burgeoning composites business. In 1995 John Nielsen was instrumental in introducing Price to Thomas Bscher, the German banker who was active in historic racing and fancied a switch to the new BPR Global Endurance Series with the McLaren F1 GTR. “I knew John from Formula 3 days. He and Thomas were making plans to compete in BPR and he asked me if I’d be interested in running their team. He called me at the right time: I was bored. Then Moody Fayed came along and we ended up running two cars.” Bscher had backing from the West cigarette company, while Fayed was a scion of the Harrods-owning family, and the two DPR run McLarens presented top class opposition to the Gulf sponsored team’s two lead drivers, Ray Bellm and Lindsay Owen-Jones. In the West McLaren, Bscher and Nielsen scored outright wins at Monza and Donington Park, and were on the podium at Le Castellet, Jarama, the Nürburgring, Anderstorp, Nogaro and Zhuhai. The results were ample to give Bscher and Nielsen the BPR title, to the chagrin of Ray Bellm who won four of the first five races and another later in the season, but was still out-scored. “Thomas was a good driver, better than I expected” Price admits. “He and John were fast and consistent” but their bid to win Le Mans failed as the Dane crashed the McLaren on cold tyres after a long pit stop. The Harrods McLaren joined the contest at Monza, the third round of the series, with lead driver Andy Wallace partnered by Justin Bell. The yellow and green car looked a picture, and the debut was accompanied by a posse of glamour girls with teddy bears (the stuffed variety!). This was Bscher’s first win, while Wallace and Bell finished fourth, just off the podium. Bellm and Maurizio Sala won at the Nürburgring, Bscher and Nielsen were third, Wallace and Bell fifth, and the result really stunned the German fans as McLarens claimed all five top positions. German pride was restored only by the knowledge that the McLarens were powered by bespoke BMW V12 engines, beautiful power units designed to last an entire season without a rebuild. Wallace and Justin were joined by five-time Le Mans winner Derek Bell for the 24-hours and theirs was a valiant effort, leading for much of the distance in constantly changing weather conditions. In the night, JJ Lehto was catching the Harrods McLaren by as much as 12 seconds per lap in the Ueno Clinic-sponsored McLaren (“he was absolutely fantastic in the rain, in the night” admires Price), but the Harrods effort was ultimately undone by a clutch failure three hours from the end, steadily losing ground to finish two scant laps behind the Ueno Clinic McLaren. The pendulum swung to the Gulf McLaren team managed by Michael Cane in 1996. Bellm and James Weaver won four races outright, enough to take the BPR title. Bscher won two events, at Monza with Nielsen and at the Nürburgring with Peter Kox, while various incidents befell the Harrods McLaren, Wallace and Grouillard winning only at Silverstone. Wallace will never forget the race at Anderstorp, the airfield circuit in southern Sweden, when a huge ball of rubber was thrown up and smashed the windscreen right in front of his face, showering the interior with fragments of glass, some of which went into his eyes. Wallace steered the car back to the pits, a new screen was fitted in double-quick time and the yellow McLaren still managed to finish in fourth place overall. Finishing fourth and sixth at Le Mans in 1996 was more satisfying than finishing third the year before. “We were so disappointed to be third in ’95 after leading for so much of the time” says Price. “In ’96 there was a much stronger field and at midnight we were so far behind, about 22nd, we were nowhere. But we kept at it and in the end the West car was fourth [Bscher, Nielsen and Kox] and the Harrods car was sixth” [Wallace, Grouillard and Derek Bell]. Under increasing family pressure, Moody Fayed then withdrew the Harrods McLaren from the series (“his uncle reckoned it was more expensive than bank-rolling Dodi’s efforts as a film producer”). The debut of the Porsche factory’s GT1-96 at Brands Hatch in September had the effect of a hand grenade tossed into the paddock. The BPR series was framed for gentlemen drivers, effectively, in privately run team cars, and the GT1-96, which duly won the Kentish four-hour race at a canter, was hugely controversial. Ray Bellm formed a protest movement which took root at Suzuka, but their protests fizzled out when the FIA, fronted by Max and Bernie, announced that the controlling body would run the FIA GT Championship in 1997, and further, that it would be run by Stéphane Ratel, the ‘R’ in BPR. Game, set and match to the FIA. Bscher switched his car to the Gulf camp, with support from BMW, and it was time for David Price Racing to move on. David Brabham and Perry McCarthy drove one car; Andy Wallace and James Weaver the other, and they climbed steadily up the results sheets as the Roush Ford V8 engines were improved. Towards the end of the season Brabham and McCarthy mounted the podium at Sebring, third overall in the first American round. To Don Panoz, and Price, it felt like winning. Panoz Motorsports settled at Road Atlanta in 1998 under the direction of Tony Dowe, while Driot’s DAMS organisation ran a respectable team in Europe, including David Brabham and Eric Bernard on the driver lineup. David Price Racing was put in charge of an exciting new project, preparing the Zytek hybrid assisted Panoz Q9, famously dubbed ‘Sparky’. Price took time off from Panoz to run two BMW V12 LM prototypes owned by Thomas Bscher and Kasumichi Goh in key events in 1999 with Steve Soper, now the team’s professional driver. The season started badly, very badly in fact, as Soper crashed the precious BMW out of the last turn at Sebring. “Be careful Steve, there’s an accident in the last turn.” “I know, Dave, it’s me!” This exchange has passed into folklore, but it’s still worth repeating. Bscher was seriously angry, not so much that Soper had crashed, but that the Englishman refused point blank to offer an apology. “I am a professional driver and I do not apologise” Steve told me. “The entrant takes that risk.” That’s as may be, but a little ‘sorry’ would have calmed things down no end with the ‘gentleman owner’. Amends were made, handsomely, at Le Mans. Bscher, Soper and Bill Auberlen raced to fifth place overall, thanks in large part to Soper driving the maximum permitted 14 hours, a sterling performance which earned him fulsome praise from Bscher. “I’ve never driven so much in all my life” Soper told Price. “I’ll never drive for you again!” Nor did he, but they are still firm friends. Price continued with Panoz into 2001, introducing the new and troubled LMP07 prototypes which suffered at Le Mans from electronic troubles and engine vibration. It was the first time that neither car finished the race and after Le Mans, Price received a call from Panoz saying he wasn’t needed anymore. Panoz continued to run the LMP cars for another couple of years before switching to the GT category with an Esperante. In 2003 Price gave John Nielsen, his then son-in-law, a hand running a Zytek prototype in the FIA Sportscar Championship, then took a break from racing to concentrate once more on building up his composites business, which had expanded into facilities in America and Wales. Missing racing again, he got involved in the Formula Renault V6 Eurocup series in 2004, running amongst others, current McLaren GT factory driver Rob Bell, then was granted one of the much coveted GP2 franchises and ran GP2 with Ryan Sharp and Olivier Pla in 2005, winning two races. David Price Racing also managed the A1 Team USA in the A1 Grand Prix series in 2005-06, but after four seasons back at the sharp end of single-seater racing, Price sold his team (“I got out at the right time”). Proving that you can’t keep a good man down, he reappeared back in sportscars/GT racing in 2011 running the Gulf Racing Middle East team, with Aston Martins the first year and – turning full circle – with McLaren’s new MP4-12C GT3 the following year. Apart from the driver management he already does, he says he would like to do some TV punditry. “Just to give an opinion, I think I know a bit by now.” I don’t want to retire, I’d get bored!” There’s the b-word again. Working with Don Panoz, though, is guaranteed to keep boredom at bay for a bit longer yet.